What's your favorite thing to see explode? Never thought about it? How could you. I think it might have to be the watermelon The hard outer shell of the fruit makes for perfect fragmentation, the watermelon's shape holds an explosive pretty darn well and its red flesh makes for colorfully gory splashes (especially against the green shell). Plus, it's watery so the explosion range is fantastic. I don't think it's a competition. 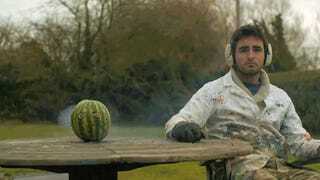 Just look at the SlowMoGuys blowing up a watermelon and try and think of something better to blow up. The watermelon looks like some super bomb from Mario Kart. The Slow Mo Guys used a banger firework to blow the melon up and filmed it at 2500FPS. Delicious.